In this latest issue of Imagine Publishing’s popular Linux User & Developer you’ll find my two-page review of NextThingCo’s clever CHIP single-board computer and PocketCHIP hand-held computer, combined into a single piece thanks to their similarity. The CHIP was launched to crowdfunding enthusiasts as the world’s first $9 single-board computer capable of running a fully-functional GNU/Linux desktop user interface, long before the Raspberry Pi Zero hit the market. It was met with considerable scepticism, but launch it did – and, earlier this year, became available to buy outside crowdfunding for the first time. NextThingCo also launched the PocketCHIP, a demonstration of just what you can do with the matchbox-sized CHIP. An entirely open hardware design – meaning you can take the PocketCHIP and tweak it to your needs before building your own – the PocketCHIP acts as a carrier to a CHIP board running a custom operating system and adds a built-in touch screen, keyboard based on cheap but awkward bubble technology, and an audio output. The software is limited, to be sure – there are only six overall applications available, and while you can install your own you won’t find them appearing in the PocketCHIP’s menu system nor are they likely to play well with the extremely low resolution screen – but I can’t deny having had a seriously fun time playing with the device and its 90s aesthetic. 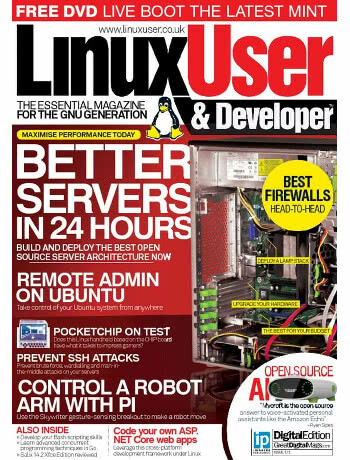 For the full review, including benchmarks against the rival Raspberry Pi Zero, you’ll want to head to your local newsagent, supermarket, or pick up an electronic copy via Zinio or a similar distribution service.